Simple ingredients come together in this wonderfully flavorful Peanut Chicken Stew – a perfect example of West African comfort food at its best! It’s been over 15 years since my friend, Bobson, first made this dish for me in Germany. A refugee from war-torn Sierra Leone, Bobson was a young man in his late 20’s trying to make a new life for himself. He had never gone to school or learned how to read but he possessed a depth of wisdom that drew respect from those who knew him. Friendly and out-going with a winning smile and a great sense of humor, Bobson was also kind-hearted and generous with what little he had. He invited me and a couple of friends over for a traditional dish from Sierra Leone. After the first bite I was hooked. He served it with something he called pounded yam (aka “fufu”), a thick, starchy neutral-tasting substance that’s ground and then reconstituted with water. You pull off a wad of it and make an indentation with your thumb to serve as an eating utensil to scoop up the food and mop up sauce. The next time he invited us for dinner the unanimous request was that he make that same dish. This time I watched him make it. And that’s the dish I’m sharing with you today: Bobson’s version of Sierra Leonean plasas. 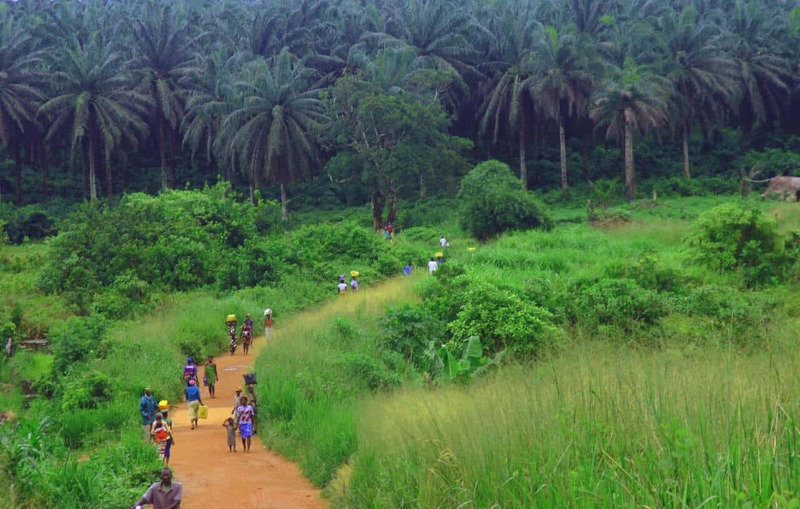 The scenic road from Kenema to the Kailahun district in Sierra Leone. This dish is simply called plasas or sometimes also referred to as palava sauce or palaver sauce. It doesn’t refer to a specific recipe so much as a specific kind of dish: Plasas is a sauce comprised of some type of greens (either spinach, collard greens, kale, etc), some kind of meat, peanut butter for flavor and thickening, and often dried fish. It’s commonly served with some kind of starchy side dish. Simple ingredients come together to produce a BIG flavor in this delicious saucy stew. Chicken, peanuts, tomatoes, greens and seasonings are showcased in this winning dish that will leave you licking your fingers. 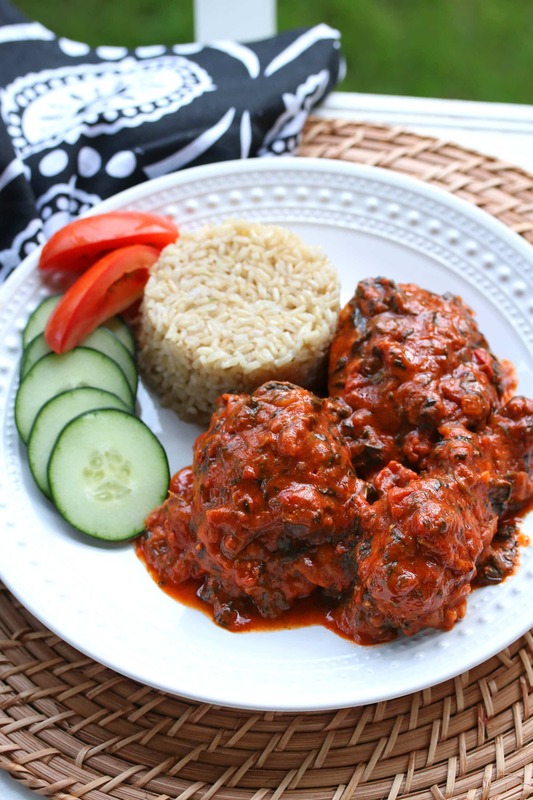 A wonderfully satisfying meal, this Peanut Chicken Stew is a perfect example of West African comfort food at its best! Heat some oil in a heavy pot or Dutch oven until very hot. Generously brown the chicken pieces on all sides. Remove the chicken. In the same pot cook the onions until caramelized. Add all remaining ingredients. Bring the sauce to a simmer and stir until the peanut butter is fully incorporated. Add the chicken pieces, nestling them in the sauce. Cover and simmer for at least an hour. Add salt and pepper to taste. This stew is perfect for leftovers because it tastes even better the next day after the flavors have had time meld. Serve with steamed rice or African fufu and your choice of vegetables and a leafy green salad. 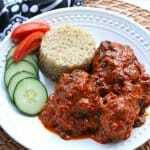 Simple ingredients come together in this wonderfully flavorful Peanut Chicken Stew; a perfect example of West African comfort food at its best! Heat some oil in a heavy pot or Dutch oven until very hot. Generously brown the chicken pieces on all sides (crucial for the flavor of the sauce). Remove the chicken. In the same pot, add some more oil and cook the onions until caramelized. Add the remaining ingredients and bring to a simmer, stirring until the peanut butter is fully incorporated. Return the chicken to the sauce, nestling it in the sauce. Cover and simmer over low for at least one hour. Add salt and pepper to taste. Serve with steamed rice or African fufu (see blog post for explanation). 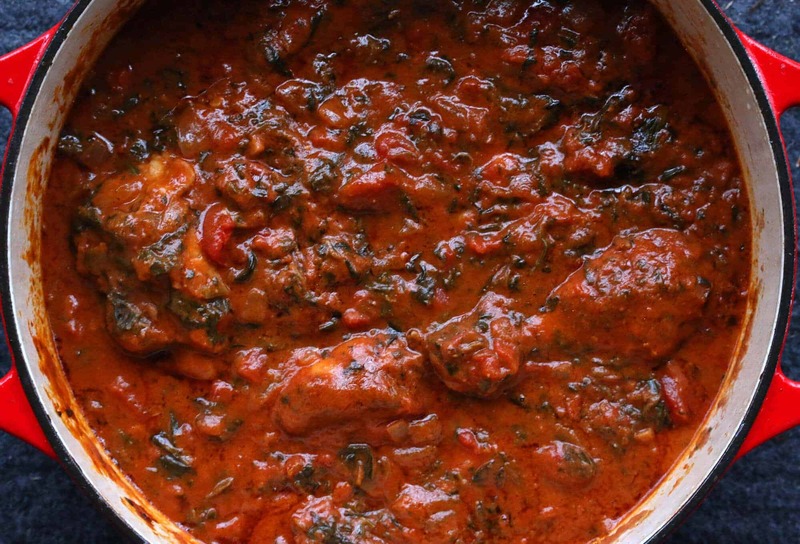 **This dish tastes even better the next day after the flavors have had more time to meld. What an interesting post and experience! This looks like something I need to try. The flavors sound soooo good. I need to try this! I love all your stories about your travels. All these flavors sound amazing. It’s neat to hear that nearly every culture has a “starchy side” that they serve. I grew up with poi/taro. Very yummy food & recipe. Its sounds too good. Thanks for sharing. I’ve never heard of West African Plasas before, but it looks and sounds DELICIOUS! I’d love to travel the world with a dish like this. I love that you make such interesting recipes like this. So fun! WOW!! This dish looks and sounds incredible!! This sounds incredible! I am usually not a fan of peanuts in savory dishes but I definitely want to try this! YUM! I love the sound of that sauce!! It looks amazing! I love this kind of international recipes made by people actually coming from a particular country. I have a Syrian friend who cooks for me from time to time, she doesn’t believe in writing down a recipe, if I want to have one from her she has to cook it together with me, so I can see everything she does. The results are always great, she’s one of the best cooks I know. I’ve never heard of this dish before! Can’t wait to give it a try! This looks lovely but I have never seen tomato bouillon cubes in the UK, is there a good alternative? Thanks. Hi Emily, traditionally two common seasonings used in West Africa cooking were ogeri and soumbala (a fermented sesame seed product and seeds from the néré tree respectively). But as ogeri has become more pricey and soumbala production has gone done as a result of deforestation, in more recent decades the bouillon cubes have come to replace them for that flavorful umami element. Some West Africans substitute the Maggie cubes for things like seaweed and fermented fish but Maggi is still the staple ingredient in much of their cooking. I lived in England for 7 years and am pretty certain I’ve seen tomato bouillon – if not in cube form then in powder/granules (either Maggie, Knorr, Bisto, etc). Even a packet of tomato soup would work as a substitute, just dump the dry, powdered contents of the soup in this dish. If you can’t find anything tomato-flavored, then go with chicken bouillon cubes/granules and add some tomato paste. That’s great thank you! I haven’t seen your website before but there’s some wonderful sounding recipes that I am looking forward to trying! Tomato chicken bouillon cubes are found in Mexican grocery stores? Any by you? Oh boy ! Must try ! Thank you ! Thanks for sharing this recipe! 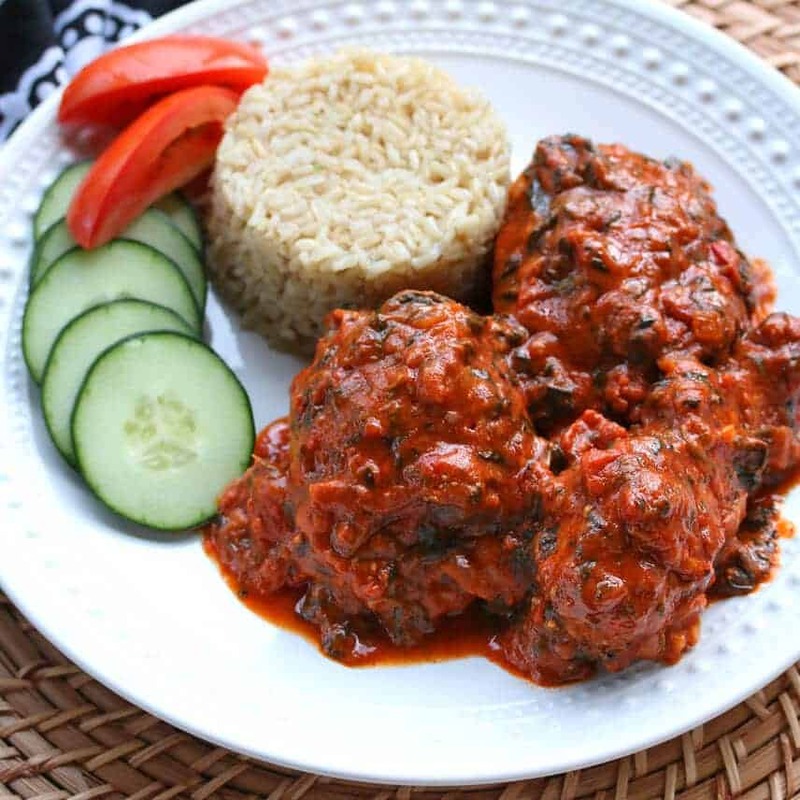 I really enjoy your posting of international cuisine and happy to see a West African dish. A former colleague of mine from Uganda made a chicken dish in a peanut sauce, and I was hooked! Looking forward to making Plasas this weekend! Come on ladies….i can only keep uncooked chicken pieces in the fridge for two days. Must admit it sounds and looks tasty. I worked in Nigeria for 5 years and loved a lot of their national dishes. My two absolute favourites were Pepper Chicken and Dodo and Beans. Dodo is plantain. I miss these two and a good bottle of Rock beer! Do you have any recipes? Hi Mike, I don’t at the moment but those would both be great additions, thanks for the idea! Your recipe is cooking as I type. Looking forward to the end of the hour cooking time. I was able to find tomato cubes in the Hispanic section of my grocery store although not Maggi. Knorr and another brand, Cons-Mate, were available although the latter is a chicken and tomato concentrate. Will rate it after I taste it but so far, it’s looking good. Fortunately, I love tomatoes and this is very tomatoey (?). Saying that, I enjoyed it very much but next time, will use more chicken, maybe 1 1/2 lbs. I used a crunchy peanut butter which added a nice touch. The sauce over white rice is very nice and there is a lot of sauce left over. I would give it 4 1/2 stars. Wonderful! I’m glad you enjoyed it, Roz, thank you. I like this dish even better the next day – the sauce has an even richer flavor once the ingredients have had more time to meld. Love this dish! When I lived in France I had the opportunity to eat this multiple times with various African (continent) families. Sometimes it was very simple without the greens, and sometimes thinner or thicker. The one things is I wrote down the recipe from one or two people, but lost it in the move back to the USA. Thanks so much for this. I tried it once and had to add more roasted tomatoes and substituted some collard greens and kale for the spinach, and love it! Put it with a little fufu (very thick mashed potatoes), and I am in heaven. Thanks, Jason, I’m so glad you enjoyed it! Fufu, yes. That’s the way my African friends served it to me in Germany as well – that very thick, white mashed potato-like substance you use to scoop up the stew. They called it “pounded yam” but I believe it’s the same as fufu. Yes… I think you are right that back home for most countries it was usually yam or cassava or something like that, something with a lot of starch. But a lot of times that I had it in France it was mashed potatoes with additional potato starch to make it extra pliable, because I think it was more available and you didn’t have to go to the specialty market to get your ingredients. When in a foreign land you got to use what you got, to make it as close to home as you can within a budget :) Doesn’t diminish my experiences at all! Some of my best memories are sharing “foods of thier homeland” with the African families and refugees that I had the pleasure of knowing. Thank you so much for the amazing West African Plasas recipe! It is absolutely delicious and just became one of my new favorites! Looks like a Great recipe but it seems like 1lb of chicken is on light side for this dish. The picture shows several pieces of chicken which have be more like two pounds of chicken. My husband is Gambian, and I’ve vizitsd Gambia and Senegal MANY times so I cook a lot of West African dishes. Plasas is made with some some sort of leaves – cassava, kale or collards with okra. Domoda is usually the peanut butter stew and it’s usually without greens – it may have other vegetables such as bitter tomato, squash, cassava, chicken or some other meat, garden egg (eggplant), potato. It’s never used with ground nuts (peanuts) that aren’t ground into a paste. Iris, as with most dishes regional variations are bound to exist. If you Google “plasas” you’ll find that it’s made with peanuts in multiple regions including the Congo (see CongoCookbook.com) and even the Gambian information website (AccessGambia.com) features plasas with peanut butter. See also Afrotourism.com and Africanbites.com and many more examples of plasas made with peanut butter. You are right. Regional ingredients/names for dishes do vary and I apologize for coming on to your site and challenging your dish. I would hate if someone did that to me. What an amazing man! How awesome that you got the chance to meet him and learn this fantastic dish from him. Such a flavorful dish! I know it’ll quickly become a regular meal in our house. I made it vegetarian by replacing the chicken with garbanzo beans and chicken broth with vegetable. Eat over rice.Perfect! What a hearty sounding stew! Pinning this to try once the holidays are over and we are needing some dinner inspiration! 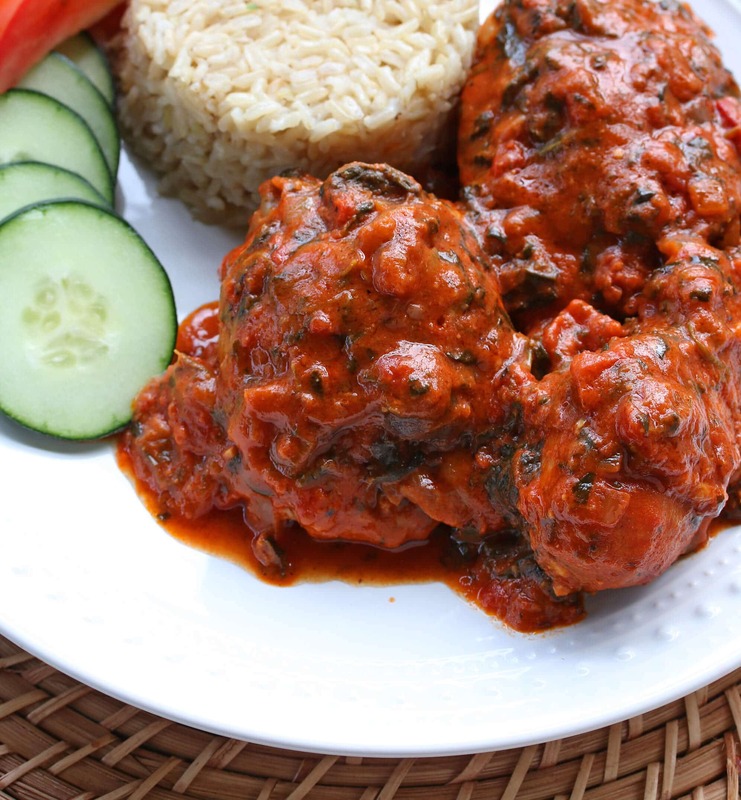 I don’t think I’ve had African food before but this looks so flavorful and comforting! I’m definitely going to try this stew. Looks amazing! Wonderful, Colleen, thanks so much! I love it! Packed full of amazing flavors! I made this dish a few days ago. I found it too intense in tomatoes for my taste, so I added a can of low fat coconut milk and added already cubed and roasted butternut squash at the end as well. That mellowed it out and we liked it a lot better. I suppose in Gambia this dish enjoys many variations. It’s lovely delicious and very pretty on the plate. 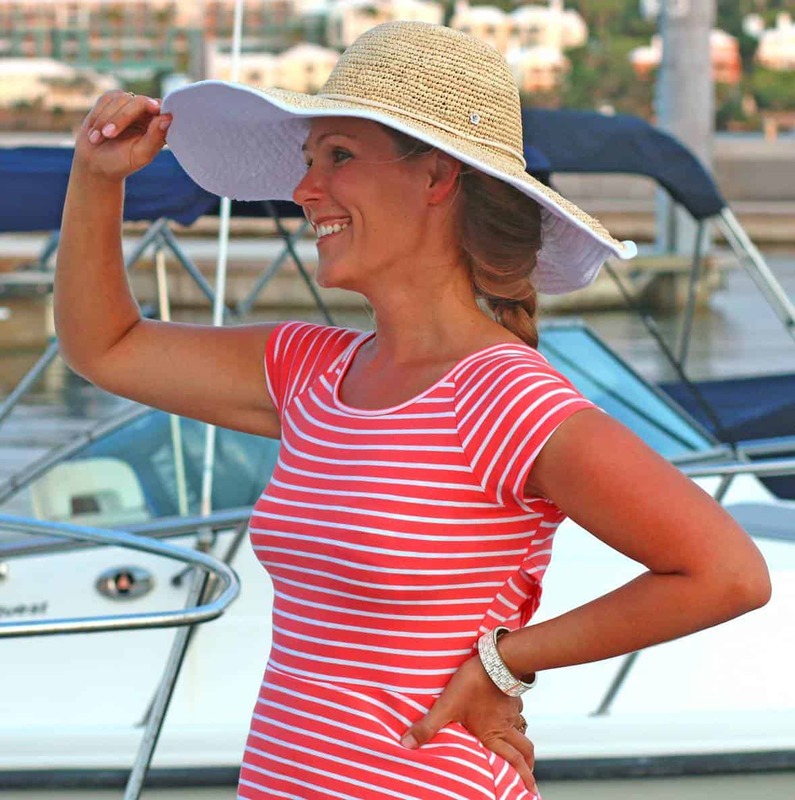 Hi Catherine, I’m glad you enjoyed it and were able to adapt it to your taste, thanks for the feedback!